Welcome to Casa CoCo, our home away from home located in beautiful Mayan Riviera on the Caribbean Sea. Casa CoCo is a new luxury beach front condominium located in the Quinta del Sol condominium complex in the exclusive world-class residential resort community of Puerto Aventuras. The beautiful and spacious home is decorated in a comfortable yet contemporary style and comes fully equipped for luxury and comfort. Casa CoCo is a 3 bedroom, 2 bath unit with high brick-domed ceilings complete with US-level luxury amenities such as flat screen satellite TV, CD/DVD, stainless steel appliances, washer/dryer, wifi, and so much more! All rooms have air conditioning and ceiling fans. Just steps from the spacious terrace, enjoy the incredible pools and stunning white sandy beach & azul waters filled with colorful sea life inviting you to snorkel and explore. The master suite has a King size bed and an en suite bath. The guest bedroom has a Queen size bed. There is also a smaller third bedroom with a Full size bed. The gourmet kitchen is fully equipped, perfect for dining at home in comfort. 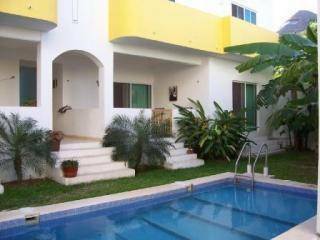 Casa CoCo, is just steps away from the Puerto Aventuras (PA) marina. PA has the only deep water marina between Cancun and Belize. The marina boasts international restaurants, dive stores offering world-class ocean, cave and cenote diving, quaint shops and cafes all situated around a marina with dolphins, manatees, sea lions and yachts. Puerto Aventuras also offers a 9-hole golf course, world-class fishing, tennis courts, snorkeling, spas, dolphin discovery, parasailing, skateboard park, luxury hotels, markets and delis, and of course the beautiful palm fringed white sandy beach!! Whether you are on holiday just to relax and to forget the hectic pace for a few days or are eagerly looking for more adventure, you are considering the right place. The condo is well equipped with almost everything you need to be comfortable, relaxed, and feel at home. Above all, we are sure you will have fun and leave with many wonderful memories. With our two boys growing-up so quickly, we want to take this opportunity to show them other parts of the world so they can experience what we have enjoyed so much through our many years of travel. We are a very clean and organized and will take utmost care of your home. We've completed one very successful exchange In 2012. During the winter months, we are very active Northeast skiers. We are looking for an exchange during the winter months to areas near ski resorts. Since our condo is a second home, dates are flexible. Puerto Aventuras is a private gated residential resort community located in the heart of Riviera Maya on the Caribbean Sea. It is situated near many fabulous attractions, such as Mayan ruins (Tulum, Coba, Chichen Itza), eco adventure nature parks (Xcaret, Xel-Ha, XPlor), numerous beautiful white sandy beaches, cenotes, nature reserves (Akumal, Sian-Ka'an biosphere), island of Cozumel (scuba diver's paradise), jungle parks (Hidden Worlds), Playa del Carmen&#8217;s vibrant nightlife and so much more! Most located less than 30 minutes away! Puerto Aventuras is located 77km (48 miles) South of Cancun International Airport.